Like many of us, Cathy Wild felt anything but creative as a child. “My meager attempts at crafts produce pathetic puddles of clay with curled edges—ashtrays—that I dutifully bring home to my mother, who smiles weakly and says nothing,” recalls the artist, counselor and life coach. 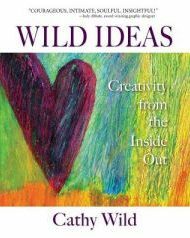 In her debut self-help book, Wild Ideas: Creativity from the Inside Out, Wild guides us through the seven stages of the creative process, warts and all, and shows us that people who doubt they possess any imagination at all are often the ones who are stifling the most. Beautifully written and delivered, Wild Ideas is flawless in its presentation, lyrical style, and potentially life-changing message. Like a good friend who knows how to comfort and catalyze at the same time, Wild encourages others, not with a push but a gentle nudge, to press through the doubt, insecurity, and other roadblocks that threaten to sabotage their fulfillment. For readers who sense that something is missing—not just working artists, but those who “just want to feel more alive and connected” —this book is the perfect place to begin.